Snapfish lets you use your photos in a variety of items to turn them into beautiful décor, photo books, prints, mugs, and more. There is also a section dedicated to special occasions, which is perfect for holidays, birthdays, and baby announcements. Got some great photos of your dog, cat or bird? Celebrate your furry and furry friends with a variety of products. Custom throw pillows, photo keychains, Christmas ornaments and leather luggage tags can showcase your best pics. Ordering prints or a photo project is a simple process: first, you create an account if you don’t already have one. Next, you upload the photos and select the ones you want to use to create the project to add it to your cart. Once you’ve placed your order, you can keep track of its details like shipping and tracking. But don’t forget to check out the Deals page, which is full of discounts, coupons, and deals which can save you some money. If you don’t have any photos, there are plenty of personalized gifts you can select from to express your style. Mugs, notebooks, journals, blankets, pillows, tote bags, towels, stationery, and many other products are available, and once you find the one you like you select one of the many designs that don’t need a photo and customize the product with a name or personal message. 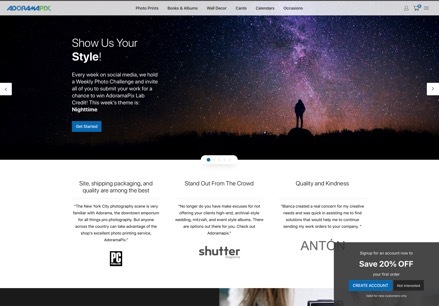 Snapfish is easy to use and has a large catalog of items for your projects, but the best picture websites like Snapfish, take a look at the following sites we have discovered. For cheap canvas prints, few picture websites can beat this one. Your canvas will be ready to ship in 24 hours, and in great, vibrant quality using solvent-free HP latex inks. You can print on a finely structured canvas, or on acrylic, where the photo will be behind a crystal-clear glass made of acrylic which gives it a beautiful depth effect. Another option is having it printed on glossy vinyl foil placed on an aluminum composite panel. This makes the image look sharp and adds a premium quality look. Paying for your order is quick and easy, and you can use any major credit card, PayPal, or Amazon pay, but if you sign up to the newsletter you will get some great discount coupons regularly sent to your mailbox. 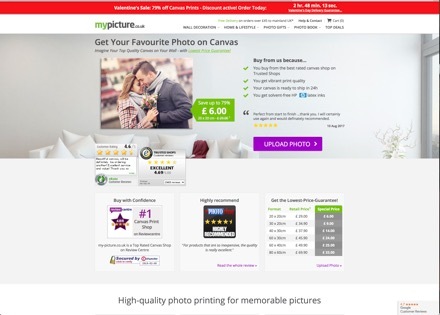 Similar to Snapfish, there is a Top Deals page where you will find highly reduced prices on many photo printing options. The best quality canvas at the most competitive prices is what you will find here. 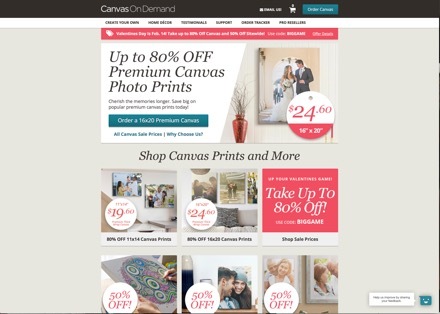 Over a million satisfied customers have purchased museum-grade canvas at this website, and your satisfaction is backed by a 100% money-back guarantee. To turn your photos into canvas prints all you have to do is upload the photo from your desktop computer, laptop, or mobile device, select the canvas size and any cropping options and complete the checkout process. A few days later the canvas print will be shipped straight to your door, ready to display on your wall. There are a few other options for printing your photos, like home décor and pillows or blankets, but canvas printing is their specialty. You can also order a photo split, which divides the image across three or four canvas prints for a much larger impact on your space. They are recommended for florals and landscapes, and there are many sizes and thickness options available so you can get the exact coverage needed on your wall. Want to create a photo book you won’t be able to put down? Then visit this picture website. Using Quick Start templates, you can easily design and create your own lay-flat books in many styles and topics. To get started, you can shop by cover, size, style or paper, or you can use your photos to turn them into a greeting card, perfect for any occasion, or wall décor with metal, framed, and wood prints. If you’re a new customer, signup for an account and get a special discount on your first order. This website is one of the best online photo printing sites like Snapfish and has been serving the needs of the community in the photography niche for more than ten years, providing excellent service at an affordable price. This Snapfish alternative’s flagship product is its photo book line. You can even have a professional designer create a photo book for you, and you only pay a small design fee if you order the finished book. If you’d rather do it yourself, you can instantly lay out your photos, rearrange them, and add captions as needed. There are over 40 styles with preset layouts and backgrounds, and the book can have up to 1,000 pictures. Like other sites similar to Snapfish, your photos can also be printed on many items, such as calendars, mugs, iPhone cases or Mason jars. If you open a free, you will receive 50 free prints, a set of address labels, and a magnet at no charge, so go ahead and sign up today. You also get unlimited free photo storage! 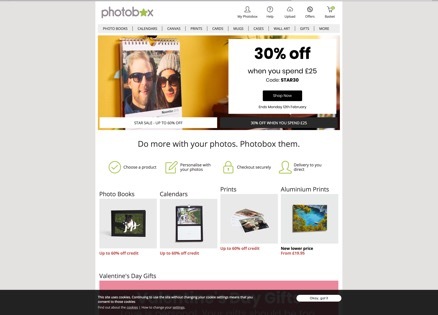 Photobox brings your photos to life. 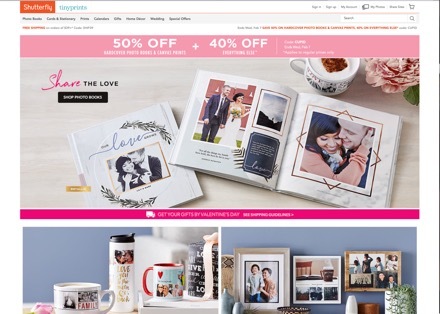 For photo albums, there are tons of colors, shapes, and sizes to pick. Or you could turn those photos into a wall art masterpiece, or put them on a personalized mug, mini magnet, or similar items. Just choose a product, personalize with your image, checkout securely, and have it delivered to you. For mobile devices there are dedicated apps, both for iOS and Android, so your photos can be printed straight from the app. Like Snapfish, there are always great offers posted on Photobox, where you’ll find discount and voucher codes, as well as current specials and promotions. Just find the one that best suits your needs so you can then apply it to your shopping cart before checking out.